If you’re travelling abroad to take part in winter sports, it’s essential that you have adequate insurance, because most standard policies don’t cover winter sports. Medical treatment for injury abroad can be extortionately expensive, and the EHIC (European Health Insurance Card) won’t cover all eventualities, even if you are in an EU country. Many people don’t know that the EHIC only entitles you to a very basic level of care. What Winter Sports Can I Insure Myself For? There is a long list of sports and activities that come under the ‘winter sports’ umbrella. These include snowboarding, snowmobiling, skiing (down hill, off piste, cross country) dog sledding, snowshoeing, speed and ice skating, glacier walking, ice climbing, ice hockey, curling, and tobogganing. You can usually buy an add on to a travel insurance policy which covers you for ‘winter sports’ but in a lot of cases this means skiing (and not off piste) or maybe snowboarding. It’s absolutely essential that you make sure any activities you intend to take part in are covered by the policy – making assumptions where winter sports are concerned can be a costly mistake. Winter sports travel insurance cover has become more specialised since people discovered there’s more to the slopes than skiing and turn to more exciting and also risky pursuits. How Will I Know What I’m Covered For? There’s only one way to find out, and that’s ask. It doesn’t hurt to check the small print yourself, either. There will be a list of permitted activities attached to any policy, and before you buy the policy, make sure that your chosen adventures are on that list. Some of the activities mentioned above are never likely to be included in a standard ‘winter sports’ insurance policy and will always need a separate policy. Don’t be tempted to skimp on this. Winter sports travel Insurance should cover you for injuries and accidents that could feasibly be caused through taking part in what the insurers describe as winter sports activities. A standard winter sports travel insurance policy will probably cover you if you fancy venturing off-piste or trying your hand at snowboarding, but it doesn’t hurt to check first and there are usually guidelines and restrictions involved, too. You’ll need to tell the insurance company if you have any pre-existing medical conditions before you book your winter sports holiday, and ensure that you will be covered if you have to claim. If you don’t disclose something, you could end up with a problem on your hands as legally an insurance company can refuse to pay up on an otherwise valid and often totally unrelated claim using the grounds that your medical condition could have affected your ability and somehow contributed to the accident. Be warned! How Much Does Winter Sports Insurance Cost? It’s always going to be more expensive – just because the activities on a winter sports holiday are more risky than your standard sun and sea holiday. The premiums for places like North America and Canada are higher than those in Europe, too, as a rule. As far as equipment insurance is concerned, if you take your own you need to make sure it’s covered, but often you can hire it at the resort to save money – it would be likely to cost you just in excess baggage if you take your own! 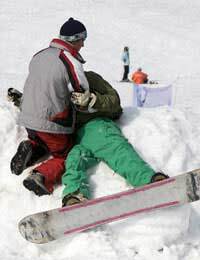 If you’re going out to experience the thrills that the snowy slopes have to offer, don’t take a chance on injury or accident, make sure you have the insurance in place before you go. Hopefully you won’t ever need to call on it, but for peace of mind, don’t neglect the insurance!